Come on, get in vogue with THREADS. THREADS’ annual fashion show gives UNCG fashion design students a chance to show off their creations. This year’s show will also make a young girl’s dream come true. The sixth annual show, “Under the Influence: Art, Music and Cinema in Fashion,” hits the runway Friday, March 18, at 8 p.m. This year marks the event’s debut on campus, in Cone Ballroom on the main floor of Elliott University Center (EUC). Doors open at 7 p.m. It gives us an opportunity to showcase our work to peers and industry professionals. These are lessons we, as students, can take with us. Previous shows were spread over two nights to accommodate attendees. Cone Ballroom offers a 550-seat capacity, Rogers says, and a chance to draw more UNCG students in addition to parents and people working in the fashion industry. THREADS is a networking and social organization for UNCG’s Consumer, Apparel and Retail Studies (CARS) students. The group, which began with five members, now boasts 78 active members, Rogers says. THREADS members will model all clothes in the show, with the noted exception of 12-year-old Hannah Payne. Hannah, who turns 13 the week of the show, was born with spina bifida. She dreams of becoming a fashion model – a dream that will come true March 18 thanks to the Make-A-Wish Foundation and THREADS. Hannah will be pretty in pink, modeling a tulle ball gown, and a pink-and-green dress inspired by Lilly Pulitzer. 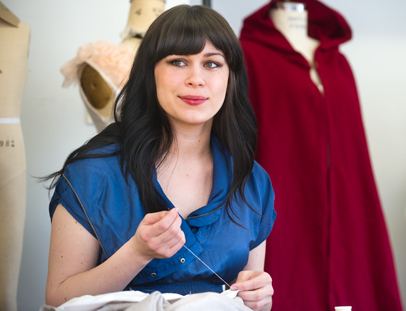 THREADS members designed and made the gowns, which are Hannah’s to keep after the show. “The show should be a nice birthday present for Hannah,” Rogers says. Rogers, a senior, has taken part in three previous THREADS fashion shows. She says the shows provide valuable and practical experience for CARS students. “Under the Influence” explores the influences of the arts in fashion. Plan to see original clothes inspired by “Breakfast at Tiffany’s”, pop artist Andy Warhol and Brit rock band Muse. Also new this year, Reed Benjamin of WUAG, UNCG’s student-run radio station, will deejay the show. Funds go toward funding the annual fashion show, covering costs of field trips, and paying for social events. Buy tickets at the box office in the EUC. Prices are: Front Row/VIP, $15; General Admission, $10; UNCG Students, $7. Free parking is available in Oakland Deck behind Yum Yum Ice Cream, accessible from Spring Garden Street at Kenilworth and Forest streets. For more information, contact tsthorpe@uncg.edu.